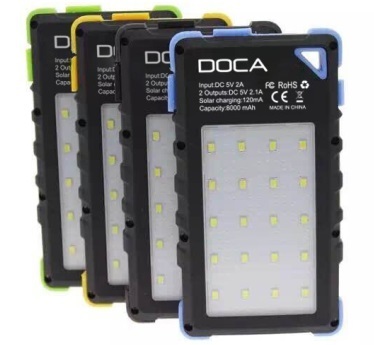 We invite you to read a brief description on the portable chargers DOCA. This is another well-made power bank. This device in addition to a mobile battery also has features a high light (including a function of SOS). The equipment can be powered by sweat electrical outlet and built-in solar panel. An additional curiosity is that the equipment has UV possible to verify the authenticity of banknotes. Portable Charger D-S800 as I serve? Note Do not directly shine UV light on the eyes !!! The charger is lightweight, waterproof, shockproof and kurzo resistant. The device is ideal in difficult terrain, it is waterproof. When you think about going camping this type of device will surely help you in many situations, it is 8000 mAh high capacity. This capacity should be more than enough for a full, double the average load the phone. 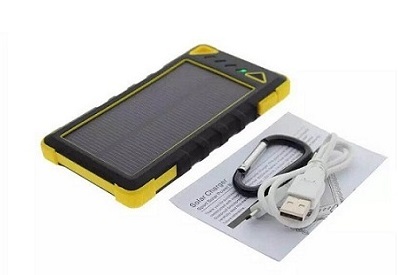 In addition, when sunny days you can recharge mobile charger. Another advantage of this device is a light panel, which will allow you, for example, map reading at night. 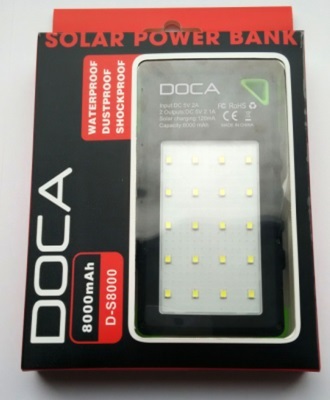 This is a very interesting device and the company DOCA ensures robust performance. Who was the initiator of photovoltaic panels? - Panels operate on the basis of the potential difference. This phenomenon has already noted in 1839 Becquerel.